Manufactures of microphones have developed several pickup patterns that are specifically designed for their intended use, so the following is brief description of what they’re called and what they do. 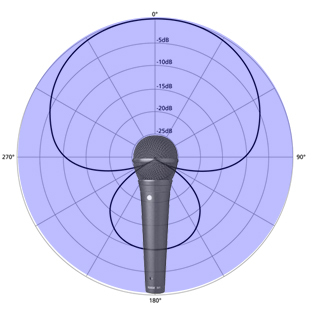 Cardioid pattern: The cardioid pattern is best for general live work with normal onstage volumes. 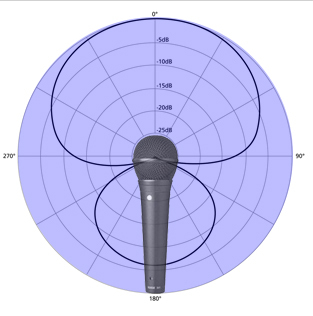 It requires the artist to be close to the microphone before it picks up the signal and allows for a little bit of pickup bleed on the left and right sides of the capsule. 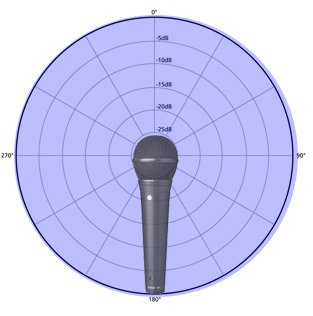 Super Cardioid: This pattern is much narrower than the standard cardioid and is best for live work where there are high stage volumes and you don’t want a lot of stage spill getting into your mic. As a result the artist will have to be right on top of the mic or they wont be heard. Hyper Cardioid: This pattern is even more directional than it’s super cardioidbrother, designed with higher rejection of sounds coming from the side and a more focused narrower front. This pattern is best used where the intended signal source is very stable and not moving around much. It can also be very good for live recording where maximum isolation of multiple artists performing close together is needed. Unidirectional: This pattern is extremely focused and narrow. It will only pickup signal that is directly in front of it, as a result it is not a very musical pattern (meaning it’s not very subtle) and is best left for specialist use. Omnidirectional: As the name suggests this pattern has equal pickup areas in a 360 degree circumference (left, right, up, down). As this pattern hears everything it can be useful in a recording situation if placed in the middle of a room and allows the proximity of the artists to determine the mix points of the session. It can also be used where people who are shy of microphones (such as speeches & interviews) do not want to get to close to the mic. Another use could be on the centre of a round table conference where direct access to the microphone is not possible. Bear in mind that amplifying this pattern through a PA system can be quite problematic as the mic will hear it’s own amplified signal and potentially start a feedback loop. Bi-directional (or Figure-8): This pattern has equal pickup from front and back but with very good side rejection. It is commonly used for the recording technique called “mid-side” where two sources can recorded at the same time from the front and back of the microphone. Some artists that have sung harmony together for years don’t like recording their parts separately as the feel and blend of the performance can be lost. In this situation try the “mid-side” technique.